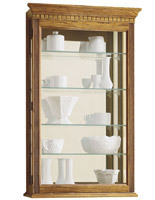 Adjustable brackets let you customize your literature dispenser. 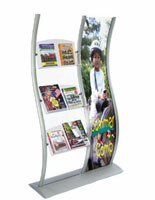 Clear acrylic is great, as visitors are able to read each headline before even reaching your dispenser. 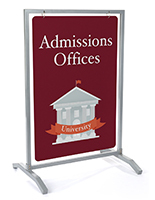 Flyer holders are double-wide displays for brochures and large-format posters. 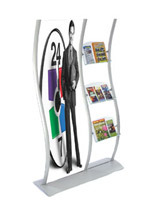 These wave-shaped units, flyer holders are approximately 7-feet tall, making your fixtures literally stand above competitors'. 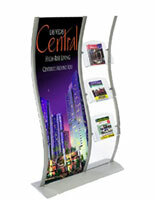 Flyer holders, such as our other curved units, are great for any high-traffic, indoor environment. 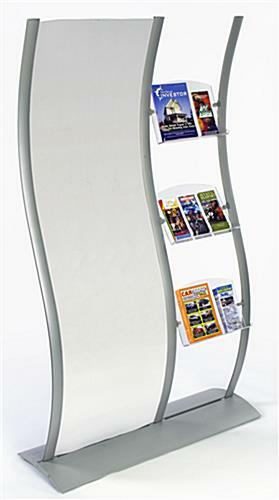 Retail stores and convention centers, for example, would both greatly benefit from the implementation of these magazine stands. Flyer holders utilize clear acrylic for your literature pockets. 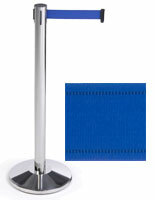 These promotional units, flyer holders have an overall structure made of silver-coated, brushed aluminum. When used indoors, your magazine holders will not rust! These literature racks are also double-sided flyer holders! We provide your flyer holders with clear plastic lenses to cover your posters and protect them from dust and debris. They also enable you to showcase advertisements in two directions, reaching even more potential customers. 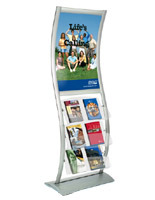 Flyer holders, also known as a brochure display fixtures, feature moveable brackets to let you alter the height of each acrylic pocket. You can also use these brackets to change a pocket's angle and orientation. Please Note: Graphic is not included with display frame. When designing your images, keep in mind the actual graphic size is 24"w x 77"h, where 1/2" on each side is covered. Your graphics should be printed on regular poster paper, so as to ensure they will fit securely within the grooves. This will not be a problem for any printing service facility.